I don’t know if you remember from my gel pen round-up post but one of my favorite pens is this Muji gel pen in hexagonal, colored body. It’s sleek and minimal in design, and I like that the barrel is hexagonal and is entirely grippy in texture, which make it feel just right in my hand. This Muji pen model came in several colors with the pen barrel colored to match the ink color. I like the black ones in 0.3 or 0.4mm. The barrel has a slim window near the tip so you can see the ink level. As you can see, the pen in the foreground without the product label is low in ink. Smart design! 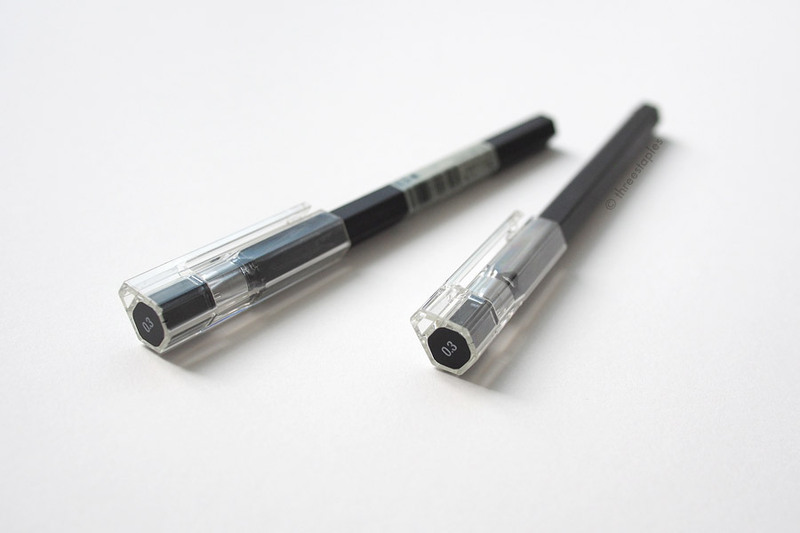 Uncapped: Muji (top) and Pentel Slicci in black (bottom), with Slicci refill 0.4mm still in its packaging in the middle. I think I was looking for refills for an Ohto pen when I came across this massive refill guide (thank you!) and learned that the Pentel Slicci refills can go into this particular Muji pen. Luckily, I had a Pentel Slicci in my stash that I wasn’t using (it’s too slim for my hand), so I quickly disassembled it and was able to confirm right away. In fact, the refills look almost identical, except that the plastic of the Slicci refill is coated, while Muji’s refill is see-through. I haven’t used up the Slicci refill yet but I don’t think this coating will make the indicator window in the Muji barrel useless because the coating is only at the top 2/3 of the refill and the window is near the bottom. Awesome. Oh, and the Slicci refill writes just as well as the original Muji refill. I wouldn't be surprised if the Muji refill is from Pentel. FYI, the Slicci black refill is labeled BGR3 for 0.3mm and BGR4 for 0.4mm. I also learned from the same source that the ink cartridge in Pentel Hybrid Technica (in the cap-style) can go in the same Muji pen. It's a bit longer than the Slicci refill by about 1cm but it looks like it'll just fit. I don’t have the Technica to confirm it but more options sound good to me, even if I have to trim the refill top potentially. (Edit: No cutting needed. I obtained a Technica refill (KFGN4) and it works perfectly). Plus, the refills for the Technica come in a wider selection of tip sizes than the Slicci refills, at least presently at JetPens (US). Interestingly, the Japanese Pentel site says there are no refills for Slicci, and the Hybrid Technica isn't even included in their current line-up (but its refills are listed under their refills). The refills in the longer Hybrid gel pens K105 and EK105 look compatible too but they only come in tip size 0.5mm and are too long for the Muji pen. Might need some messy cutting to make them work. So, yeah! I’m currently using my old Muji pen with the black Slicci refill in 0.4mm, and I was once again reminded how much I enjoy using it. If you love this pen, too, don’t throw it out when the ink runs out just because Muji is apparently phasing it out. The aforementioned refills come in basic colors: black, blue and red. If you have the same Muji pen in a non-basic color instead, like green or purple, Slicci comes in a variety of colors, and you can liberate the refills from them. The only down side is that it’s a more expensive (and a bit wasteful) way of getting a replacement. But then again, I don't remember if Muji had refills in non-basic colors for this particular model to begin with... Better than not having any options, right? Anyway, I think I'll stock up since the future of Slicci refills and Pentel Hybrid Technica seem a little mysterious at the moment. Lesson learned! The US Muji online shop still has some of this pen model, scattered throughout the site in limited colors and tip sizes, here and here, none of them being what I prefer. I couldn't find them in person the last I checked Muji SF. Not sure about other locations. (Edit 6/20: I checked again and Muji SF now has some but in limited selections). I find Muji's product naming too generic and frustrating at times, especially when I'm searching online. I suppose it's to stay true to their "no-brand quality goods” philosophy. But at least they should be consistent. This Muji pen model is listed online (linked above) under different names, as far as my search abilities go: “Gel Ink Ballpoint Pen Hexagonal” and “Gel-ink Hexa Ballpoint Pen”. If you find a secret stash somewhere I haven't linked yet, let me know! A great review: Muji Gel Ink Ballpoint Pen Hexagonal – 0.3 & 0.4mm – in Blue, Sky Blue, and Light Green | No Pen Intended. The answer to my problem was right there in the comments, too! I bought the Pentel Slicci refill from JetPens. In addition to the regular Pentel Slicci, they also have Slicci in metallic colors, as well as Hybrid Technica refills KFGN3/4/5. Tokyo Pen Shop also has Slicci in a wide variety of colors. This isn’t a sponsored-post; I’m just a happy customer at both stores.